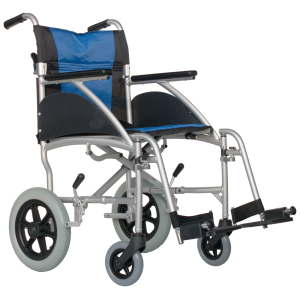 The Excel G-Lite Lightweight Folding Transit Wheelchair is a lightweight aluminium frame wheelchair and compact in size making it ideal to transport with ease. The Excel Glite comes supplied with comfortable, padded back and seat upholstery making it comfortable for the user, which are easily removed for cleaning. One of the lightest wheelchairs in the Excel range, with a total weight of only 9kg. 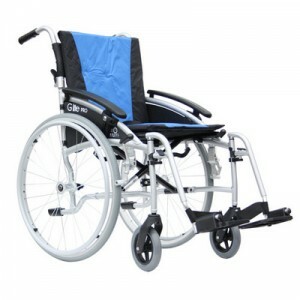 It is the perfect wheelchair to take with you wherever you go due to its light weight and compact size when folded. Unlike some other ultra lightweight wheelchairs the Glite has swing away detachable footrests fitted as standard, again making it even easier to store and transport the wheelchair when not in use. As with all Van Os Medical Wheelchairs the Glite comes with a standard 10 year frame warranty, so you can be sure you chair is built to last.